Text The text displayed in the menu for this item (when displayed). ToolTip The tooltip text that appears when you hover over the menu item. You can use it to keep a value with additional data about the menu item. For example you can use it to store a unique ID, which you are planning to use when handling click events to identify the menu item or to look up more information. This value is not displayed. You can use it to forward automatically the user to the corresponding URL when clicks this item. If you don’t set it you should write a code which will react to the Menu.MenuItemClick event to decide what action you want to perform. If the NavigateUrl property is set, this sets the target window or frame for the link. If Target isn’t set, the new page is opened in the current browser window. The Menu also exposes a Target property, which you can set to apply a default target for all MenuItem instances. If false, this item can’t be selected. Usually you’ll set this to false only if the item is a subheading that contains selectable child items. ImageUrl The image that’s displayed next to this node. The image that’s displayed next to the menu item (on the right) if it contains subitems. By default, this is a small solid arrow. The image that’s displayed immediately underneath this menu item, to separate it from the following item. 1. 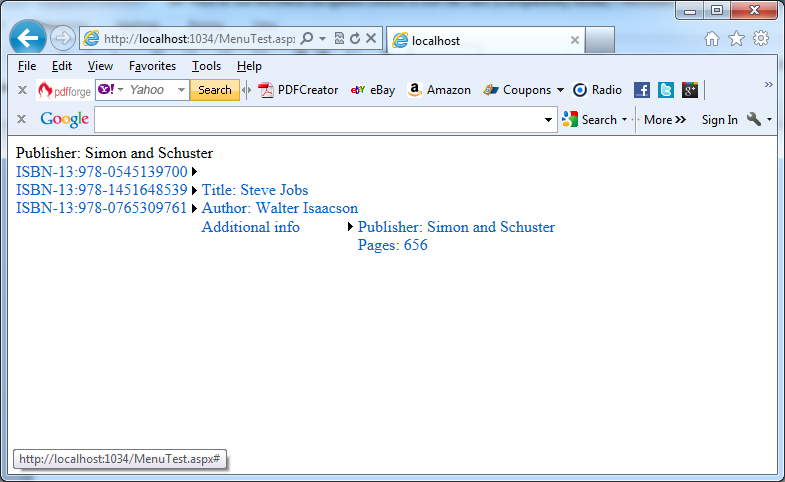 The file TreeViewTest.aspx is replaced with MenuTest.aspx. 2. The code behind file MenuTest.aspx.cs is used code from the TreeViewTest.aspx.cs where: MenuItem replaced TreeNode, ChildItems replaced ChildNodes, Items replaced Nodes. // Create the menu item for this category. Can expand an arbitrary number of node branches at a time. Shows all its items inline in the page. Does not support this functionality. Supports on-demand filling and client callbacks. Supports templates. Does not support this functionality. Supports horizontal and vertical layouts, depending on the Orientation property.